provisions of AR 614-200, Chap 6.
service obligation after EOD school as listed in AR 614-200, table 4-1.
for a Top Secret Security clearance and may not attend EOD training. assignment may not be allowed to attend EOD training without their branch’s prior approval (DA Fm 4187). attendance. Stabilization of current drill sergeants and detailed recruiters will not be broken. military personnel file? Yes______ No _______ If so, why and when did you receive the Article 15? 7. 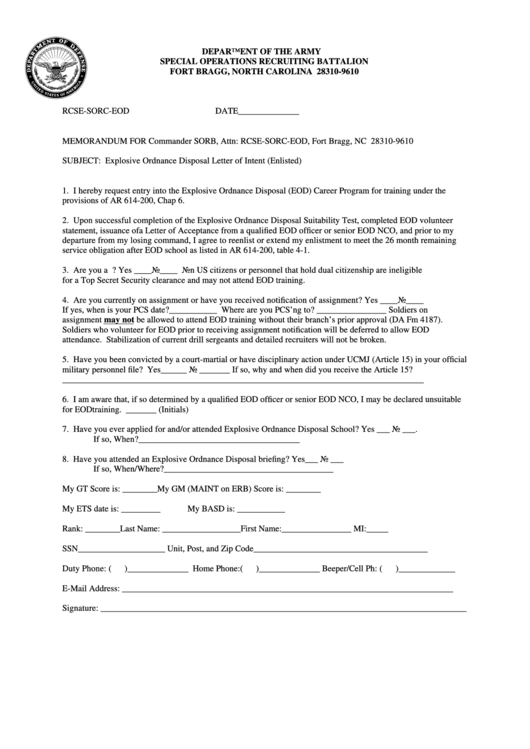 Have you ever applied for and/or attended Explosive Ordnance Disposal School? Yes ___ No ___.